In her talk, Annen introduced the basic concepts of heat transfer computation. She emphasized the incremental emplacement way of magma. 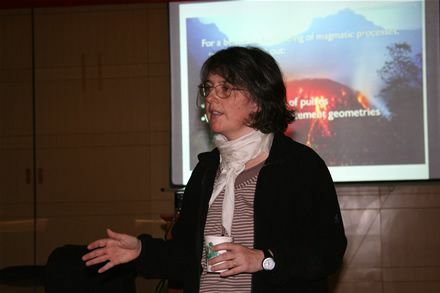 She showed several examples to illustrate how her numerical methods can be used to clarify some key issues in the field of igneous rock, such as the reasons of formation of I-type, S-type or A-type granites, the constraints of forming magma chambers, and how to estimate the hidden volume of a magmatic body below a certain size of magma aureole.